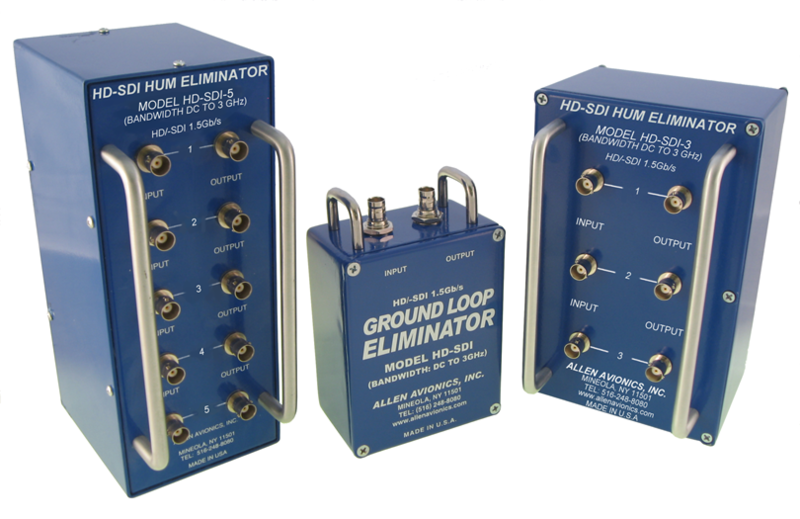 The HD Series of high frequency ground loop eliminators is designed for High Definition Broadcast chains. Even though SDI is more immune to extraneous noise and low frequency components (hum) problems can still exist. HD-SDI Serial Digital signal transmissions at 1.485Gbps over a cable contain a range of low to high frequencies like analog signals and are subject to analog-type distortions like induced noise as well as unique digital distortions related to sampling and quantizing. These distortions may result in a variety of visible impairments. Using the Allen Avionics HD-SDI Ground Loop Eliminator you can eliminate the potential for this kind of data loss. See (Outgoing Video) The model HD-SDI Ground Loop Eliminator supports the four transmission rates of SMPTE 259m and SMPTE 292m 1.485Gbps HD SDI.